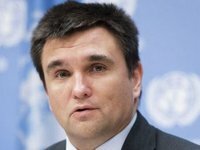 Slovakia's Minister of Foreign and European Affairs Miroslav Lajčák whose country has taken over the one-year chairmanship of the OSCE will pay a visit to Ukraine in two weeks and will travel to Donbas on a visit, Ukrainian Foreign Minister Pavlo Klimkin has said. "Congratulations to Slovakia and my good friend Miroslav Lajčák for assuming the 2019 OSCE Chairmanship-in-Office! Wishing Slovakia to be a guardian of OSCE values and principles, blatantly violated by Russia. Looking forward to welcoming Miroslav in Ukraine in two weeks, we will go to Donbas together," Klimkin wrote in a tweet on Twitter on January 2. As earlier reported, Slovakia started its one-year chairmanship of the Organization for Security and Cooperation in Europe on January 1, 2019. Thus, for the next 12 months, Slovakian Foreign Minister Lajčák will serve as the OSCE Chairperson-in-Office. According to media reports, Lajčák said earlier that during Slovakia's chairmanship of the OSCE "Ukraine will be our primary priority" and promised to pay his first official visit abroad in his new capacity in early 2019.